Greetings again from the darkness. The theory is that heavy dramas find it challenging to attract an audience during times when real life and newscasts are filled with daily downers. One need only tune in to the local news to see that we are in just such a “downer” period right now, and it would be difficult to argue that this latest from writer/director Dan Fogelman (“This is Us”) is anything but the weightiest of heavy dramas – with an emphasis on the preciousness of time and life. It’s highly likely that this film will fall into the love it or hate it category. It’s a sure bet that many critics will bash it as pretentious and overly melodramatic. It will be labeled a manipulative tear-jerker with outlandish coincidences. I won’t debate the merits of that criticism, and instead will remind all that creative fictional storytelling can often seem fantastical and improbable, but that doesn’t mean it can’t also be entertaining, thought-provoking, and carry a worthwhile message. Because of the overlapping and intertwining stories, characters and timelines, filmmaker Fogelman breaks the film into 5 chapters. This should allow most viewers to keep track. Chapter 1 is entitled “The Hero” and features Samuel L Jackson as the unreliable narrator – a recurring theme throughout. It’s also in this chapter that we meet Will and Abby. 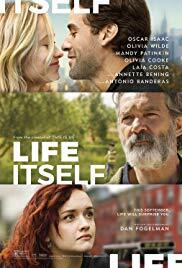 Will (Oscar Isaac) is an emotionally unstable man who has been in a mental institute for the 6 months since his wife Abby (Olivia Wilde) left him. He is despondent and attending required sessions with a therapist played by Annette Bening, and we get cutesy flashbacks to the Will and Abby courtship. See, Abby and Will are the kind of couple who see themselves as Tarantino characters, argue about the merits of Bob Dylan (poet or Chewbacca noises? ), and come up with the worst dog name in cinematic history. Chapter 2 is where we meet Dylan Dempster, daughter of Will and Abby, and granddaughter of Mandy Patinkin and Jean Smart. She is named after the poet songwriter, not the Star Wars character. There is a cool effect that evolves Dylan’s face from a child surrounded by death and tragedy to a just-turned-21 year old played by Olivia Cooke (THOROUGHBREDS), who also happens to front an atrocious punk rock band and flashes quite the temper. Chapter 3 shifts from New York City to Carmona, Spain where we are introduced to “The Gonzalez Family” of Javier (an outstanding Sergio Peris-Mencheta), his wife Isabel (another excellent performance from Laia Costa, VICTORIA), and Javier’s boss Saccione (Antonio Banderas). Javier works Saccione’s olive orchard, as he and Isabel start a family. Chapter 4 focuses on their son Rodrigo (Alex Monner) as he grows into a talented young man while his beloved mother suffers with a debilitating disease. Finally, in Chapter 5 we meet Elena Dempsey-Gonzalez (Lorenza Izzo) and the story comes full circle … or all the dots are connected. Even the identity of the narrator who took Samuel L Jackson’s place after Chapter 1 is revealed. Filmmaker Fogelman seems to be better suited as a writer (CRAZY STUPID LOVE) than as a director (DANNY COLLINS), and his script here is extraordinary in its ambition. While there may be some developments that seem contrived, there are also some terrific moments throughout. We see a cross-continent ripple effect that makes this the CRASH of family dramas (the 2004 movie, not the one from 1996). Who is a hero and who is a villain is one of the key elements here, but Fogelman seems intent on making the point that traumatic events and tragedy shape who we are as people. The message is that our ability to bounce back – to “stand up” after being knocked down, is really what defines the human experience. For those who keep an open mind, the emotional jolts provided here will likely resonate. Greetings again from the darkness. I often give extra credit to filmmakers for trying something challenging and different, even if the final product might fall a bit short. What I refuse to do is ignore the opposite … a lazy attempt by a filmmaker who thinks they can skate by simply because they picked a interesting topic. Director David Frankel (The Devil Wears Prada) takes the screenplay from Vanessa Taylor and then seems to sit back and bank on the strength of three lead actors to make a statement. Meryl Streep is the greatest living actress and maybe the greatest of all-time. She can turn any character into a subject of interest and doesn’t disappoint here as Kay, the disenchanted wife of Arnold, played by Tommy Lee Jones (himself an excellent actor). In an effort to save a marriage gone stale after 31 years, she books a week of intensive marriage counseling with Dr. Bernie Feld (Steve Carell). Grumpy Arnold reluctantly agrees to attend despite his belief that all is “fine” with their marriage for the singular reason that it’s lasted 31 years. Besides that, he has golf to watch on TV … well, “watch” with his eyes closed. What follows is not the laugh-fest promised by the trailer, but rather a semi-serious look at marriage for the over-60 generation. I say semi-serious because intense and thoughtful topics are raised, but the film continually makes U-Turns at each fork in the road so as to avoid coming up with any real solution or digging deeper into cause/effect. Instead, some prime opportunity is wasted for this to be either a riotous look at marital frustration or an intriguing dive into what makes men and women of this generation unable to communicate. My contention is that just because this is a movie about marriage for 60-somethings, we shouldn’t give the filmmakers a gold star for effort. The great John Wooden said, “Never mistake effort for results“. There are some humorous moments … some laugh out-loud moments, but not very many. There are some serious topics broached, but only by skimming the surface. Mostly, the scenes are obvious and predictable and Streep and Jones carry the burden of lifting the material. As a movie lover, I demand more. The three leads are excellent. Mr. Carell does a nice job of playing the understated counselor role. He is smart enough to know that this film belongs to Streep and Jones. There is also minor support work from Ben Rappaport, Marin Ireland, Mimi Rogers and Elisabeth Shue. All of these characters seem tossed in for variety only. None really drive the story. though it seems either one more or one less scene with with Shue in the bar would have made sense. The first 20 minutes of the film has three songs that just overpower the scenes. I guess this is to ensure that every viewer recognizes the mood of the characters. It’s as if the director recognized the material was lightweight. I have labeled this genre Gray Cinema, and have previously stated that I expect we are on the front end of this trend as baby boomers demand more movies about themselves. The trend is commendable, but again I say, we should demand more and better. Showing up is half the battle … now let’s see the other half.